Back then, I could just tell them I was a high school teacher and the conversation would roll along. It was awesome haha. I'm naturally introverted, so small talk is typically pretty exhausting for me. Now? I have to start planning my answer to that question the second that I meet a new person. I've almost gotten it down to a science, and it's basically a choose your own adventure scenario. If they are too old to understand what a blog is, I say: “I own a marketing company”, which is true. If I roll with #3, I brace myself for a ton of questions because most people haven't met a professional blogger before. Every once in a while it's fun to pull back the curtain on my life so that M$M readers can get to know me better, so I figured I'd give you an idea of what it's like to run a website for a living! Do you actually make money? On the surface, this question always feels a little insulting coming from a complete stranger. But really…it's a fair question haha. Even now that I've been doing it pretty well for a few years, “professional blogger” still sounds like “professionally lives in parents' basement and plays video games” if we're being honest here. 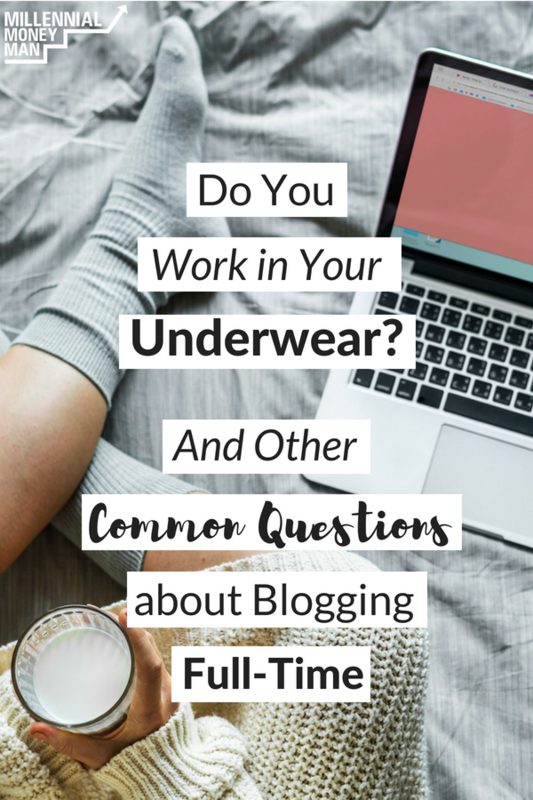 Blogging is one of those professions that just doesn't seem like a real job, even though there are a lot of people out there that do what I do full-time and actually make a bunch of money doing it! But yes, I've been very fortunate so far in my career to make a lot of money doing this. It definitely didn't start out that way, but I've worked extremely hard since I've started M$M to build something really special. So…how do you make money? When I first started? Hoping that a sponsorship or something like that would come in. A lot of bloggers won't tell you this, but blogging can take a really long time to monetize. I quit my job way too soon to run M$M full-time, which is why I had to start doing marketing work like running Facebook ads for companies and other tasks that were loosely related to blogging. That has definitely changed though. Now I make money from affiliates that I work with, courses that I sell, advertising, sponsorships (sometimes), and digital marketing work that I still do for a handful of small businesses. Essentially, a blog is a platform that you can use to build out a bunch of different income streams over time. If you ever want to see exactly where all the money comes from for my business, you can always check out my income reports. Do you work from wherever you want? My wife and I used to live in an apartment that didn't have a space for a desk, so I used to grab my laptop and find a coffee shop to work from. Now I have a pretty sweet office in our house, and I've found that I really enjoy working from there. It's kinda nice to be able to walk into the office and go into work mode, and then leave my work there. But, there are plenty of bloggers out there that work from RVs, vans, and sailboats. I'm just not about that life. I've even seen some bloggers share photos of working from a beach and other obscure nature scenes, but I really haven't tried that too much either. I mean, working from a beach sounds cool and the optics of a laptop on a beach are nice, but logistically…it's a nightmare. Like…how do you keep sand out of your keyboard? Isn't the screen hard to see if it's bright outside? These are the questions that I've always wanted answers for haha. Do you work in your underwear? OK…yes. BUT, not all day! Then, I'll make some coffee and roll into my office to start talking with the M$M team and get on the same page for the day. Believe it or not, running a blog is a lot of work. But, I also have the Facebook Side Hustle Course to work on with my business partner Mike, marketing work, and other projects that are always in the pipeline. After I get a good idea of what my day is going to look like, I shower and put on a normal amount of clothes for the rest of the day. Wearing what I want is one of my favorite things about my job because I HATED wearing khaki pants and a button down when I was teaching. I know it sounds a little silly for that to be a big deal, but I really think that most jobs should just let people wear what they are most comfortable in. What's the best thing about blogging full-time? I think for me, it's the flexibility. Now don't get me wrong – I work a tooooon. But, I love it, and I especially love that I get to work exactly the way that I want to every day. I've never felt “trapped” since I've been doing this full-time. I've also been able to meet some really cool people that I would never have met if I wasn't working online. For example, my website developer is a dude that moved from Colorado to Thailand and is now a digital nomad. How obscure is that? But, he's a good friend now and we talk fairly regularly even though there is a 13 hour time difference between the two of us. There are also all of my blogging friends that do the same thing that I do, and we all meet up every year at the Fincon convention to hang out. There are a lot of really cool people in this industry, and nearly everyone I've met is really nice. The loneliness. Fortunately, I don't struggle with this nearly as much as I did in the very beginning. In fact, I don't think I struggle with it at all anymore. But when I was just starting out, it was really just me, my computer, and a lot of empty coffee shops. As cool as that sounds, the lack of social interaction does wear on you quite a bit when you're used to a normal office environment at your previous gig. I think a lot of online entrepreneurs go through that but don't ever talk about it. Now it's totally different though. I have a whole team that I talk to every day and I'm constantly doing video calls with people on the various projects I've got going on. I also have a bunch of awesome readers now that really feel like family to me. I interact with as many M$M readers as I possibly can every day! I'd say that I have a really healthy amount of social interaction right now, which is awesome. Is blogging going to be a thing in 20 years? Honestly, I don't know, but I do think that having a platform to talk to people with is something that I will always have. It could just look different (radio show, podcast, etc.). I do so many different things right now that I almost don't consider myself to only be a blogger. Like I mentioned earlier, the blog was just the platform that I've used to launch a bunch of different projects from. So…the answer to this is a solid “maybe?”. I think I'll always do something like this because I'm really good at it and it's a lot of fun, but who knows. What else do you want to know? I'm a pretty open book when it comes to this kind of stuff! You should! It makes it easier for sure. Great post, Bobby (and quite entertaining)! I’ve been an online entrepreneur for 5+ years now, and I get asked a lot of the same questions. I really liked this article. You’re right, not most people will tell you things like the ones you’ve shared here. It’s fun to learn these “behind the scenes” lifestyle. 🙂 I hope I can do what you do someday. Already working on it and will hopefully be able to take your FB ads course soon too :). Glad you liked it! That’s awesome – looking forward to seeing you in the FB group! Thanks!!!! I LOOOOOOOOOVE my office haha. It’s pretty cool to be able to put your personality into your workspace like what I’ve done so far. Kinda feels like a little sanctuary or something (hopefully that makes sense). Thank You for sharing about the experience of loneliness when blogging full time. I think it’s very important in the beginning to think about whether working full time on the computer without the camaraderie one is used to at a workplace environment, is something one wants to jump into immediately, or work towards gradually. You’re welcome! It is important, but I think it may be embarrassing for some people to admit things like that. I’m sure I’m not the first blogger/podcaster to mention it though. This is interesting. What you described is more or less what I imagine entrepreneurs doing with their day; the flexibility and wearing what you want everyday sounds awesome. I’ve followed a few successful blogs and podcasters and have been very curious about one question – how do you think you or your lifestyle has changed since you’ve had success online? Or do you feel you’re kinda the same and just more satisfied professionally? I think it’s different for every entrepreneur. I know a lot that kinda box themselves into not having flexibility. It’s just easier to avoid when you work online. That’s a great question! I feel the same. Money doesn’t change the way you feel at all on a daily basis. I have some nicer stuff than I used to though. But it is satisfying to know that your business is doing well – the first few years are very stressful and you feel like it could all fall apart at any moment. At this point I don’t feel that way, which is awesome. I’m a part-time blogger so it may be different but I love being able to talk to people about my site. I’m naturally quiet but can’t shut up when it comes to talking about money. I’ve found that once people know I write about personal finance, the fun and interesting conversations tend to flow naturally. It’s been the best part of blogging so far. That’s awesome! I actually shy away from talking about money in social situations, but I’m glad you’ve figured out how to do it! I guess that’s why we’re all doing this right? Haha. I honestly think though that I’d still wear what I wear to work everyday now even if I worked from home, just because I like it (business casual-ish), but hey I’ll tackle that when I come to it. haha! Yeah I mean some people just like dressing well. There’s nothing wrong with that at all obviously. I…just…don’t. Haha. I don’t even know how I’m married at this point. I get these questions all of the time! I usually don’t mind answering questions and chatting with people, but a few people have really pushed my buttons when they answer with “Sooo you don’t really work?”. Ugh. I want to answer with “Yes, I work. Probably longer hours than you.” But I just close my mouth and walk away if I get that question lol. Great post! I run into the same thing. I just tell them, “I teach millennials about money,” and then let them hit me up with questions. Love your responses though! Keep it up man.